The plans would see more than 30,000 tonnes of seaweed gathered a year. Concerns have been raised over the potential damage caused by kelp harvesting on Scotland's west coast. Proposals by firm Marine Biopolymers would eventually see more than 30,000 tonnes of the seaweed gathered each year by specially adapted boats. The company has been criticised over the plans which involve large-toothed devices being trawled through kelp beds, which are home to considerable amounts of sea-life. 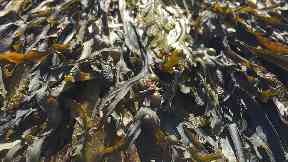 Seaweed has a number of uses, from pharmaceuticals to food, and the market for it is thriving. Critics claim the move could harm the marine environment, deplete fish stocks, increase coastal erosion and even contribute towards climate change. Nick Underdown, head of campaigns at sustainable fisheries charity, Open Seas, said: "Dredging our kelp forests is not dissimilar to clear-felling virgin rainforest. "It's one of the few pristine habitats in our seas that remain unscathed by over-intensive exploitation. "It provides a fundamental foundation to the way our seas work, providing habitat for many hundreds of species, and represents one of our best stores of blue carbon. "On land we are trying to actively recover our native pine forests, why repeat the mistake of deforestation at sea?" He believes the proposal is "completely adrift from sensible, sustainable use of our seas", and would "drag us backwards". He continued: "Our environment can sustain a vibrant Scottish seaweed industry. "But allowing mechanical dredging in the way proposed will not only undermine the health of our sea, it will undermine other marine businesses and alternative harvesting methods." Marine Biopolymers, based in Ayr, South Ayrshire, has submitted a scoping report to Marine Scotland. It outlines its plans to apply for "one or more" licences to harvest kelp in waters from Mull up to Lochinver and across to the Outer Hebrides. The scheme would be a first for Scotland and the company also aims to build a processing plant in Mallaig. The product will be used in heartburn medication. Mussel farmer and seaweed picker from Ullapool, Ailsa McLellan, said: "I'm concerned from an environmental point of view. "Kelp is a significant absorber of carbon, it buffers ocean acidity caused by warming seas and prevents coastal erosion. "It seems utterly bonkers to take that away at this stage in our planetary evolution. There is nothing green about dredging up kelp." A Scottish Government spokesman said: "Marine Scotland will consult fully on any forthcoming application and environmental assessments. "Scottish ministers will then make a determination on a licence application, taking into account the effects on the environment and other uses of the sea." A Marine Biopolymers Ltd spokesman said: "This scoping report is only the first stage of an extensive consultation process, which will be done in conjunction with a number of Scottish statutory bodies. "It will also involve many stakeholder organisations and groups from communities across Scotland. "This report is the result of several years of in-depth research into the critical environmental factors we need to consider before we started this consultation process. "It shows our initial thoughts on what and where we plan to harvest." He continued: "The next stage is the full environmental survey, which will be carried out by internationally renowned scientists, to ensure our research is accurate. "Our research has also included the work that takes place in Norway, where they have been harvesting kelp successfully for more than 50 years, in an environmentally sensitive manner. "We haven't just lifted their model; we're looking at how we can improve those methods in Scottish Waters. "We believe that we have a world leading technology and products that will balance the needs of the sustainable environment with commercial reality, producing a business that is both innovative and 'Green' at its heart."